As part of the WAM conference, certain delegates were invited to do a networking speed date session with members of industry. Yvette Myhill is the Executive Director of the Association of Artist Manager’s (AAM). I wanted to speak to her in regards to managing Kraill and what is best to do. Firstly, she congratulated me on managing a band and starting a career in band management. YAY!!! She basically just did an overview of what the AAM does and how AAM could help me as an emerging manager. Basically was just a huge selling of why I should sign up for AAM. Has me convinced to sign up. In order for bands and artists to be able to get on the Richmond Street Records Blender Compilation CD had to go through a submission process. The following process is what was used as the submission. 1. Get all students to submit tracks by Thursday 10th September 2015 at 5pm. I believe people who are working closely with the artists as well as people who would use their tracks for radio airplay justified the song choices because they represent votes. It shows a representation of people who are starting to work in the music as people either through radio, managing a band or representing a label. We received our copies of the 1000 CDs on Wednesday 11 November 2015 to the excitement of the Diploma of Music Business students at Central Institute of Technology and committee members on the Richmond Street Records. YAY!! •	At the Rosemount. As people enter the event, it will be handed out. There will also be people walking around the venue with CDs in their hands. •	Through AMRAP. AMRAP will send out the CD to community radio around the country. Where each panellist looks for new music. This includes mates sending through links of bands/ artists they are into, digitally, pitching artists to labels, streaming, through who they have played live with and radio. 25% of Spotify users skip after the first 5 seconds. As a result introductions in songs have become less important. There is no limit as to what you can do. Always push for more and what you can do to build it. When servicing music overseas the area needs to be researched, it is expensive to send CDs overseas and that streaming is the best option to get your music overseas. Saturday 7 November 2015 started with a seminar for Social Media. The Moderator was Anton Maz from WAAPA and the Panelists were Janelle Morse from Morse Code PR, Andrew Mathwin from Clarity Communications and Troy Mutton from Pilerats. This seminar answers the question ‘How can I increase reach and better engage with fans?’, as well as what is best to do and what not to do. How can I increase reach and better engage with fans? Know your audience and what they like. Think about the age of the audience and what they do. Entertain people/ audience. Make sure it’s aligned with what you do. Needs to be consistently personable. There are particular times of the day and the week to post on Facebook. In Australia 6am – 9am, 6pm – 10pm and on weekends is best time to post content. Internationally 3pm is the best time to post content. Producers work on time management, budget management, know how long it will take and plan of what you want and when. Focus in amazing songwriting rather than an amazing recording. As part of the WAM conference, certain delegates were invited to do a networking speed date session with members of industry. My first session was with Peter Gauzelli from Department of Culture and the Arts. I spoke to him in regards to working with a band to get funding for a tour and an album, what is the best option to do fist for bands that haven’t been together for very long and briefly what needs to be provided. •	Focus on getting more fans in Perth and regional Western Australia. •	Focus on writing and recording an album before trying to tour over east. •	If I am to go for a grant on behalf of Kraill, I should apply for a grant for an album rather that one for touring. In order for Kraill to be able to focus on getting more fans, I asked them to be more active on social media. In particular I wanted them to focus on Facebook and Instagram as I wanted them to engage with more with their fans. 40% of posts are to be related to their music whilst the other 60% is general interactions. Photos of them at gigs and with fans are to be posted on both Facebook and Instagram. At gigs, Kraill will need to interact with their fans before and after their sets. I was able to go to Kraill and propose these ideas to them. As a result, I was able to meet with them to start trying to put the tips in place. I started with getting Kraill to ask their fans to listen, download and review their tracks on Triple J Unearthed. As of today (Friday 13 November 2015) Kraill are sitting at number 80 (out of 100) on the overall charts and 22 (out of 25) on the rock charts. Kraill are pretty stoked about the result. 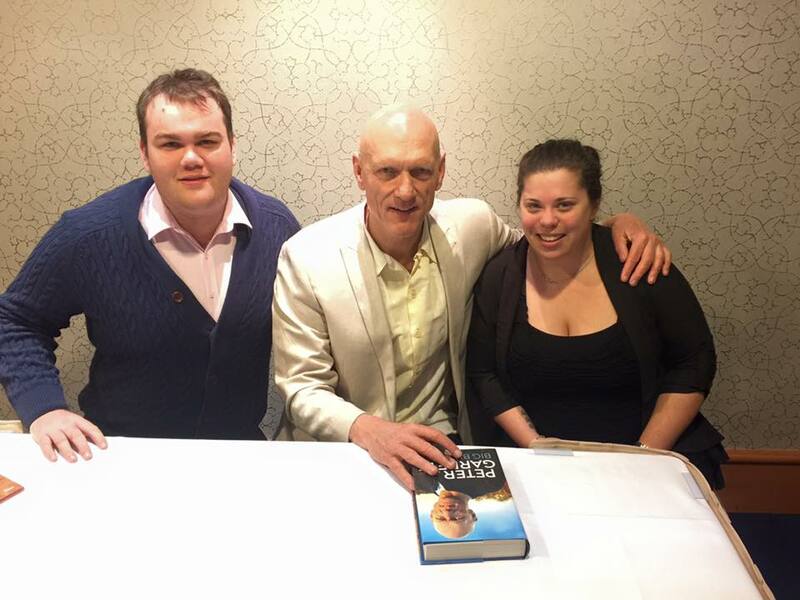 Monday 19th October 2015, Western Australian Music or WAM held a Breakfast with Peter Garrett at the Duxton Hotel. This was to launch the long awaited autobiography called Big Blue Sky. The breakfast brought about Garrett talking about parts of his life in a question and answer format allowed for the audience to have more of an understanding of his music career, his environmental activism and is political career. It was extremely interesting breakfast to have. Hearing Garrett speak about what Midnight Oil stood for and the political and social aspects that affected him; most of which he wrote about in his songs. Also to have band members who had very similar views and how this helped to create songs with the same meaning for all of them. As Garrett moved away from Midnight Oil, the public saw his activism towards the environment and his shift into politics, especially that of the Labor Party. It was particularly interesting to hear about all the work that he had done with the Labor Party that the public had not heard of. Policies and changes that he had started which had been taken over by another party member. To hear him speak about culture and the arts and how it was difficult at times, due to the backlash received as a result of being in Midnight Oil. This was often due to differences of opinion. Garrett is a highly intelligent and speaks very articulately to his audience. It is captivating to listen to him speak, especially about the things that he is so passionate about. A truly inspiring man, one that makes me more passionate about wanting to make it into the music industry and be highly successful. He makes me excited to want to read his book, see what his life has been about and hopefully be able to take some of what he has done professionally and apply it to my own career… This is something I will keep you updated with in the future; when I have read the book and found things I want to apply to my career. Definitely recommend seeing him speak next time he does a talk or function of some sought.